The Marble Faun is Hawthorne's most unusual romance. Writing on the eve of the American Civil War, Hawthorne set his story in a fantastical Italy. The romance mixes elements of a fable, pastoral, gothic novel, and travel guide. 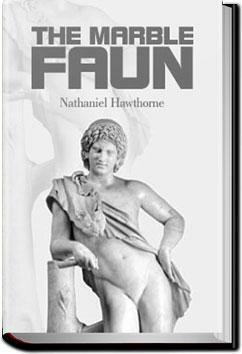 Hawthorne was inspired to write his romance when he saw the Faun of Praxiteles in a Roman sculpture gallery. The theme, characteristic of Hawthorne, is guilt and the Fall of Man. The four main characters are Miriam, a beautiful painter who is compared to Eve, Beatrice Cenci, Lady Macbeth, Judith, and Cleopatra, and is being pursued by a mysterious, threatening Model; Hilda, an innocent copyist who is compared to the Virgin Mary; Kenyon, a sculptor, who represents rationalist humanism; and Donatello, the Count of Monti Beni, who is compared to Adam, resembles the Faun of Praxiteles, and is probably only half human. . . .Whatever the dream may be, I am too genuine a coward to act out my own death in it." Σε μια Ρώμη όπου η πραγματικότητα και ο μύθος απέχουν ελάχιστα μεταξύ τους, και με έντονη γοτθική ατμόσφαιρα ο Hawthorne ξεναγεί τον αναγνώστη στα σημαντικότερα ιστορικά μνημεία της πόλης, ενώ παράλληλα παρουσιάζει μερικά από τα σημαντικότερα έργα τέχνης που βρίσκονται σε αυτή. What can I say? I love Hawthorne.